This is a follow up to yesterday's article on FE cuts. An early day motion supported by all the main unions in further education, calling for the reversal of devastating cuts in FE provision, now has the support of over 50 MPs. Scanning the list I noticed that at least one Welsh Labour MP, Martin Caton, representing Gower, has signed. Gower College Swansea, which has one of its two main campuses in Martin's constituency, like pretty much every college in Wales, is facing up to huge cuts in funding. It is also, again like many other Welsh colleges, suffering from the Welsh Government's insistence on awarding many training contracts to private providers. 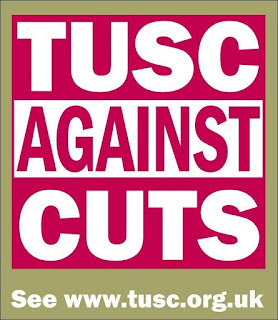 TUSC calls on Martin, who is stepping down at the General Election, to condemn his colleagues from the Labour Party, in the Welsh Government, for passing on Con-Dem cuts and to demand they reconsider. If these cuts are not urgently reversed then, should Labour win in May, then we will have a Labour Government in Westminster and a Labour Government in Cardiff, presiding over devastating cuts to further education in Wales. If you are an education worker, student or a worker considering re-training, then Welsh Labour is letting you down badly; find out how you can build TUSC and defend education.